From 116th Street to 126th Street, Morningside Avenue is known as a speedway between Harlem’s residential streets to the east and Morningside Park to the west. A traffic calming plan from DOT [PDF] now waits while Community Boards 9 and 10 weigh in. Transportation committees of both boards received presentations from DOT, followed by question-and-answer sessions, but so far, there have been no resolutions advanced from the boards and Council Member Inez Dickens remains supportive of traffic calming in concept but noncommittal about the proposal on the table. The plan, developed after the North Star Neighborhood Association was unsuccessful in winning a Slow Zone for a larger section of the neighborhood, would transform the avenue from two lanes in each direction to a narrower single lane in each direction, with a center striped median that would include concrete pedestrian islands and left turn lanes. Parking lanes would be widened, creating space for cyclists and double-parked drivers. At park entrances, DOT is proposing painted curb extensions on the west side of the avenue in the parking lane. The border between Community Boards 9 and 10 runs down the middle of Morningside Avenue from south to north until 123rd Street, at which point CB 9 jogs east by one block to St. Nicholas Avenue and continues north. Within this area covered exclusively by CB 9, the plan includes changes to Hancock Place, a diagonal that crosses Morningside between 125th and 124th Streets, with a new pedestrian signal and crosswalk, left turn lanes, and curb extensions. Although those changes are beyond CB 10’s borders, that didn’t stop committee members and the public from debating their merits at Wednesday’s meeting. DOT noted that the block serves as many pedestrians as it does drivers (about 500 during the peak evening hour), and that pedestrians looking to continue along 125th Street deserve a safe crossing. The plan was presented to CB 9’s transportation committee last week. Although the committee did not advance a resolution, advocates say they expect the full board to come out in support during its next meeting on September 19, and they hope to use CB 9’s resolution as a model for CB 10. The next CB 10 full board meeting is October 2; the next transportation committee meeting is scheduled for October 9. The plan is similar to treatments already in place on Macombs Road in the Bronx and on St. Nicholas Avenue in Harlem, which has bike lanes but no pedestrian islands. There are also some similarities to the traffic calming plan for Adam Clayton Powell Jr. Boulevard. CB 10, which, along with Sen. Bill Perkins, marshaled opposition to Select Bus Service on 125th Street, dragged its feet on traffic calming for Adam Clayton Powell, which DOT implemented in two phases without a resolution from the board. Board members Wednesday night expressed dissatisfaction with the changes to Adam Clayton Powell. Advocates said after the meeting on Wednesday that they understand DOT is unlikely to move forward on Morningside without board support. CB 10’s transportation committee asked DOT for additional traffic and quality-of-life complaint data from similar traffic calming projects, which the agency said it could provide. Streetsblog also inquired with Council Member Robert Jackson and Mark Levine, who won the Democratic primary for Jackson’s redistricted seat, which will include a larger share of the project area than Jackson currently represents. We’ll let you know if we hear anything back. Where are the protected cycle lanes? If congestion is a problem, then the way to eliminate congestion and get people moving again is to reallocate street space away from wasteful, congestion-causing car traffic. Here’s what it could look like with plain bike lanes– same width! 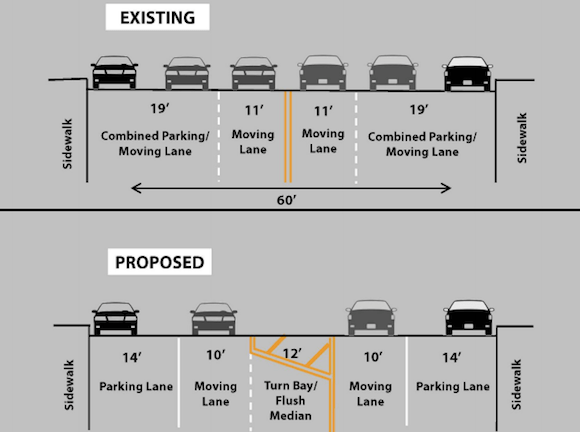 The only difference between the proposed 14′ parking lane and your 8′ parking lane + 6.5′ bike lane is paint (OK, and 6 inches). Since this is next to a long park, a two-way protected lane like the one in Prospect Park West would be great. What a terrible plan. Why not just leave it as is, except replace the outside parts of the outside lanes with protected bike lanes. You’d still have one moving lane and one parking lane in each direction, but instead of a useless “median”, you’d have protected bike lanes going both ways. On the west side is Morningside Park: pavement, curb, 4 or 5 foot strip of grass and trees, wide sidewalk, 4 foot wide strip of grass and benches, stone wall or wrought iron fence at the park’s edge. Then a block or two of the Park itself: many trees, courts, cliffs. The east side has a wide sidewalk (with some tree holes) between the street and the building fronts. There’s plenty of open space here. So without moving the curbs into the existing street, you have more room to insert bike lanes. This is an excellent plan. The problem is not congestion. Rather the problem here is that there is excess capacity so the drivers speed through this 10 block section. If you read the whole DOT presentation you will see the many benefits. This takes a road with four travel lanes and makes it into two travel lanes plus the median that functions as a left turn bay as needed. It takes wide lanes that were 11′ and wider and makes the travel lane 10′ wide instead. It creates a clearly marked 14′ parking lane that can function imperfectly as a bike lane. The attitudes of the community boards of Central Harlem (CB10) and West Harlem/Morningside Heights (CB9) are so against traffic calming that any street change that also included bike lanes would get voted down. The proposed change, even as mild as streetsblog readers think it is, will have a hard time getting community board approval. This change would be a huge improvement over the existing conditions. When the local community boards are extremely regressive and hostile to safer street designs, a plan like this is the best first step towards change. This plan is a good start and probably needs input from likely Democratic nominee Mark Levine. He’s much better than R. Jackson on street safety issues. Also both community boards need significant reforms when Gale Brewer takes office. I would work through those two newly elected people that will have significant influence over this process. What is the current speed limit on this street? What speed limit is proposed? Most traffic calming plans would slow the autos. Shuffling and mixing the users would not be traffic calming. tk, I believe the speed limit will still be 30 mph. The problem on this section of road is cars going well over the speed limit and not stopping for red lights.